As a practicing psychiatrist in the U. S. A., it is my job to get to the root of my patients’ ‘irrational behavior.’ There is always an explanation, rooted in the patient’s past, why a patient behaves the way he does. But the patient is not aware of it. Making the patient aware of the reason behind his current irrational behavior often changes his behavior, provided he is an open-minded person capable of developing a trusting relationship with the doctor. For example, a woman does not know why she breaks up with men who become seriously interested in her. Once she realizes that this has to do with her irrational fear of rejection, rooted in her childhood rejection by her father, she could learn to trust men once again. Some irrational behaviors are based on delusions, and are not amenable to reason. For example, one cannot reason with a man who believes that for the past three years Mafia has been trying to kill him, by telling him, “If the Mafia really wanted to kill you, it would take only three minutes to do so.” This person has a fixed irrational belief, which serves him a specific purpose. Likewise, you can’t reason with a deluded Jihadist that the seventy-two women he hopes to meet in heaven after achieving martyrdom cannot be virgins in view of the fact that several thousands of brainless Jihadists like him have preceded him there. Like individuals, every society on earth has its own set of irrational beliefs and behaviors. Some of these behaviors are universal, namely, they are shared by all societies on earth. A common example is religion. Most people on earth swear allegiance to one religion or another, one god or another. The degree of irrationality in religious beliefs varies from religion to religion. In one religion, people meet for prayer once a week, sing together, socialize and go home. On the other extreme, in another religion, people dance in trance-like state, holding poisonous snakes in their hands. Sometimes they die from snakebites. Very often, irrational thinking is culture-specific. For example, insisting that the guest eat and drink something at the host’s house before leaving, is a type of irrational behavior widespread in India, but not in America. In India, a guest refusing food or drink would certainly make the host very angry. Almost all Indian hosts are beyond any reasoning in this matter. Even if the guest says that he is so full that if he ate even one piece of sweetmeat he would vomit, would make no difference in the behavior of Indian hosts. Few Indians know how this irrational behavior started. Here is the true reason: For thousands of years, there was always food shortage in India. The guests did not want to strain the host’s food supply and the hosts did not want the guests to go hungry. So, both of them played this little mind-game: guests pretended to refuse food and hosts insisted they eat. Now, in the twenty first century, food is aplenty. Besides, everybody has weight problem. Yet, the mindless forcing of the guests to eat continues unabated. The host neither listens to nor believes what the guest says. His own agenda is to prove what a wonderful host he is. He is least bothered if the guest drops dead after eating at his house. It is a custom in a certain family to put a cat under a basket during the Ashtami Pooja ceremony. Just before the Pooja, the family would borrow a cat from a neighbor for the purpose. When asked about this irrational behavior, the head of the house said that it was a custom the family had followed from as far back as he could remember. An elder in the family knew how this custom started. Some fifty years ago the family had a cat, which ate the sweetmeat meant for the idol. So they had to put the cat under a basket till the Pooja ceremony was over. Now, the brainless householder felt compelled to continue this irrational tradition even if it meant borrowing a neighbor’s cat for the purpose. 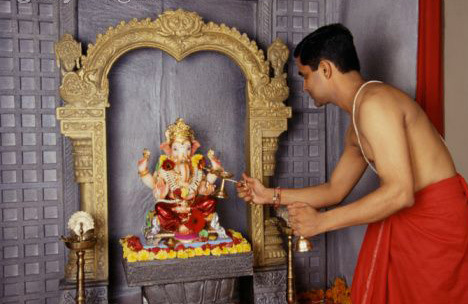 After the death of the eldest brother in the family, the surviving brothers and their children met to decide in whose house the annual Ganesha Pooja ceremony should be held. None of them wanted to take the responsibility for the ceremony, but all of them expressed great concern for their own welfare if one of them did not perform the annual ritual. All the people involved were highly educated people, but were belaboring under the irrational fear that something terrible would befall them if they did not perform the Pooja as per the family tradition. In other words, they thought that Ganesha would be angry with them for failing to continue this mindless tradition. Their befuddled mind, under the weight of irrational fear, did not understand that performing this ceremony without the mental commitment, merely to protect themselves from Ganesha’s wrath, was worse than not performing it at all. These people had no idea whatsoever about the fundamental idea of god. Obviously, they thought that god would be pleased even if they performed the Pooja without their heart in it and out of fear of punishment! A man goes to the local temple, circles the idol seven times and falls on the ground before the stone idol. When asked, where is his god, he shouts, “God is here, there and everywhere!” If you asked him, “If he is everywhere, why do you go to the temple? Can you not pray at home?” he would reply, “My father did this before me. I have done this for fifty years. I don’t feel good if I didn’t do it now.” Obviously, this man is a creature of his habit. Even though he said that God is everywhere, he did not mean it at all as evidenced by his behavior. All current irrational behaviors are based on a good reason sometimes in the remote past. Both these were reinforced by an authority figure such as a parent, a priest, a Swami or a Guru. These authority figures had vested interest in perpetuating these behaviors even though these behaviors were irrelevant now. The person indulging in the irrational behavior does not have a clue as to why he is behaving in this way. In fact, he does not think of his behavior as irrational at all even though he cannot explain the rationale for it. He has now become a mindless creature of dead habit, incapable of independent thinking and rational behavior. These people are acting on their irrational belief that Hindu religion is under attack and so they need to protect it. This irrational fear is rooted in the history of India. Over the past two thousand five hundred years, Buddhism, Islam and Christianity continually threatened Brahmanism, the decadent Dharma that pervades every atom of present day Hinduism. During the post-Vedic period of 500 B. C. E to 600 A. D., most major kingdoms of India ignored Brahmanism and promoted Buddhism. 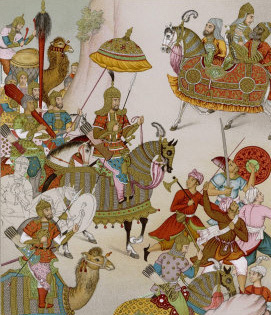 During the medieval period, Islamic kingdoms attacked Brahmanism and supported Islam. And during the last three centuries, European colonial governments ignored Brahmanism and supported Christianity. So now they do not trust the Indian Constitution to support or promote Brahmanism. Obviously, these religious fanatics are living in India of the past two thousand five hundred years. They do not realize that the Dharma they should protect now is the Constitution of India. The ancient term, “Dharmo Rakshathi Rashathah” means “The Law protects him who protects Law.” These fanatics have no idea that in the modern world this means, “The Constitution protects him who protects the Constitution.” To them, whose allegiance is to Brahmanism, it is impossible to conform their behavior to India’s Constitution. If we tell them that the Indian Constitution, the Dharma of modern India, considers their behavior as anti-social and treasonous, they would not believe us. They all consider themselves as pukka patriots. To make matters even worse, these ignoramuses have no knowledge of either the origins of Brahmanism three thousand five hundred years ago or its fundamental tenets. So they depend on what their equally ignorant religious leaders and political supporters tell them what Brahmanic Dharma is. And based on their faulty knowledge and irrational belief, they act in a manner detrimental to the nation. Links to all articles in Dr. Kamath’s earlier series on Heretics, Rebels, Reformers and Revolutionaries can be found here. Dr. Kamath’ series on The Truth About The Bhagavad Gita can be found here. This is very shallow article based on incidences you perceived narrow mindedly. If you really want to study the irrational behavior of Indians, you need to study Hinduism, and Indian culture 1st. I hope you will definitely find rational reasons which you didn’t get from the people you met. they certainly know what they are doing. only thing is they couldn’t explain it to you. I felt very insulted after reading this. which religion you belong to? does it teaches you to make fun of other cultures and religions publically? I know irrational patterns of behavior of Americans should I publish and insult all Americans for no reason???? Take a few deep breaths and relax. We are just critiquing ideas here. You know, it is something that comes under the purveyance of freedom, a thing for which many people have laid down their lives world over.If you want to write something on Americans, go ahead and do it. The Americans won’t mind it in the least bit. They have very strong freedom of speech laws and a tough mindset unlike in India which seem to be populated by weak minds who feel “insulted” by the smallest of criticisms against the grand glorious sublime eternal dharma.It is very clear that you know very little about ancient India. If you had, you would know that ideas were debated hotly between followers of different philosophies. We are just reviving that ancient tradition here. Lije, I don’t think there’s any hope for people like Prachi, and reasoning with them is simply a waste of time. These religious apologists are incapable of understanding that the way to better one’s culture is to be harshly critical of its failures. But religion is not about betterment or truth. Instead, it’s about about pride and arrogance. This is why people like Prachi assume that Dr. Kamath’s articles are actually attacks on Indian culture! Their thinking is so twisted that they really are beyond help. This is what happens when patriotism, which is simply love for one’s country, is superseded by nationalistic jingoism, which is pure arrogance based on the belief that one’s culture is superior than all others and beyond question, even when the truth stares them in the face. These people are intent on letting India stagnate in the religious filth that authoritarian belief systems have allowed to fester in our country. They do not really care about India. All they care about is showing off to the world. We have to join together and bring out the truth despite those who are holding India back. If you are an Indian and Hindu, then you are shame on India’s great spiritual and philosophical history…You are shame on the land of Swami Vivekananda and several other devotees who tried to remove the misconceptions from peoples mind and introduce true meaning of ‘dharma’ to them. If you can’t do that you have no right to comment on customs. Either take an action to bring cultural revolution make make society to change according to you or feel sorry about what you have published here. Prachi, your comments here are indicative of the abusive tendencies and fact-blindness seen commonly among religious apologists. Instead of debating ideas you attack people. Are you incapable of discussing the content of the ideas in the article? Why do you have to attack the author personally without any specific refutation of what he has said? People like you are India’s Taliban- driven by blind belief and arrogant ignorance. These are the traits of someone brainwashed by religion. It is people like you who must be ashamed for your hate and bigotry, not people like Dr. Kamath who has dedicated much of his life working for the public good. Have you even read Dr. Kamath’s articles? You say that he’s a shame on India’s “great spiritual and philosophical history”. What exactly do you know about him? Indeed, what exactly do you know about Indian Philosophy? The odds are that Dr. Kamath knows much more than you do about our history and philosophy. You say “Either take an action to bring cultural revolution make make society to change according to you or feel sorry about what you have published here”. What arrogance! How do you know Dr. Kamath has not taken action to bring cultural revolution? Do you know that Dr. Kamath single-handedly started the consumer rights movement in India? And yet religious sheeple like you sit at home behind their computer screens and attack people they can’t hold a candle to. Until those like you start looking inward at your own inadequacies, we need Dr. Kamath and others like him to raise public awareness about culturally superstitious backward ideas and alleviate suffering caused by primitive thinking. People like Prachi are the reason Indians who seek to step out of their ignorance feel discouraged. In a typical family, you would probably find loads of Prachis who take offence when you earnestly want to know the basis of a belief, and would thus ask you to stop being such a “nasthik”. In your typical friends’ circle too, every other person is probably a Prachi who equates Indianness to having blind faith in Hinduism. Hence, even raising a question about a belief would make you anti-India in their eyes. Thus, young people who sincerely want to change their mindsets are thwarted in their efforts by the Prachis around them. The fear of being treated as an outcast is only overcome with age and with exposure to the works of people like Dr. Kamath, which makes you realise that you are not alone. I am a Hindu, born into an extremely orthodox Brahmin family, brought up by a almost “paranoid schizophrenic” mother in matters of rituals and religion, grew up extremely religious and superstitious, but over the last 2 decades (I am 41 now), have learned to think rationally and analyze things a bit. I am a borderline atheist, and I firmly believe that almost all rituals are meaningless, except for those which indirectly health the nature and environment (for example, people in my village pour water at the base of the trees each morning after bath). I no longer believe in a personal God,and I have no faith in any institutional religion anymore; but I love and respect nature and I do certain things such as recycling which may help environment. I know that, with just a cancer diagnosis, I will perhaps again run to temple and pray to God; but that will simply mean that I lack mental courage, and NOT that God exists! Ajita & Lije,these Marathi religious fanatics are notoriously arrogant & inward looking when it comes to `defending’their pathetic religious beliefs.Swami Vivekanand,Radhakrishnan are some of their favourite weapons to attack the secularists & atheists with.What they imply is you are a nobody in front of these luminaries & so you have no right to attack my religion.To criticize Swami Vivekanand as a confused soul who perhaps is the father of all New Age mumbo jumbo & that Radhakrishnan was an apologist for caste system is blasphemy for them.For Prachi & her ilk it is no coincidence that they invoke these caste icons in their defense whereas Dr.Ambedkar,Jyotiba Phule,Buddha,Periyar are not only no icons but they actually despise these greats.For Prachi,`studying Hinduism’ means praising,going ga ga over the exploitative traditons from the Vedic times. This crowd,without exception,is highly arrogant.Ajita,you should have gone through the superficial,dismissive,abusive comments on their Misal Pav site.as you say,they are no hopers & one should not waste too much time arguing.For them as you keep on saying,attacking ideas & personal attacks are one & the same. Actually each jihadist is promised 72 virgins. Its a different set of women for each jihadist obviously. Such an inaccuracy might tarnish the facts in the rest of the article so please do correct it! Interesting article. I normally go through stages of curiosity about religion and go into a reading spree. The latest about Buddhism and evolution of Hinduism. I will read all the articles in this website in this phase. As with all reading, I take the contents with a pinch of salt and apply my own reasoning as well. Being a brahmin by birth and not believing in any of the rituals, I too am trying to figure out what to believe. One thing is for sure. Brahmins are not the only power-hungry sect. Every religion-running organization is the same, no exceptions. And no excuses. What they all do is wrong. They resort to all sort of activities, including modifying historical documents to protect their interests. So it will be very difficult to figure of the real teachings. Even the teachings of Jesus are clouded by what the vatican censors, and that is fairly recent. Can’t say that what the Peethas are teaching is exactly what Adi Shankaracharya preached. After his demise, the followers could have easily twisted the preachings to suit their needs. One things is for sure. Most prophets are great souls and we cannot just judge them after reading what we cannot be sure is unadulterated. If you are not sure of the veracity of what you read how did you come to the conclusion that these prophets are great souls. What evidence was used to arrive at this conclusion? It is a custom in a certain family to put a cat under a basket during the Ashtami Pooja ceremony. Just before the Pooja, the family would borrow a cat from a neighbor for the purpose… Now, the brainless householder felt compelled to continue this irrational tradition even if it meant borrowing a neighbor’s cat for the purpose. I continue to grow less and less patient with statements such as this one, not only because they are ridiculous, but also because they are pernicious. Putting the cat in the basket is obviously a ritual. Having established this, we are at liberty to ask two questions: (1) Is this ritual based on a belief, and (2) does this ritual have any social costs? With (1), we can answer an obvious no for the cat ritual. No one knew why they did that particular ritual, and as such, it was a custom with no beliefs attached to it. Making no truth claims, we thus cannot call it “irrational” in any way. With (2), unless the family were breaking in and stealing the neighbor’s cat for each Ashtami Pooja, I really don’t see any negative costs. Some may claim that (1) does have a belief– namely, that the cat being there would precipitate a reaction that would bring in the phalitam, or fruits, of the puja– but I am skeptical that this is what Dr. Kamath meant. I believe he was dealing with the cat ritual in isolation. In an environment in which people can’t tell the difference between a superstition and a taboo, it has become a characteristic of lazy minds to identify ritualistic behaviors and term them “irrational” without applying criteria (1) and (2) above. Despite the universality of ritualistic behavior, people are able to do this because ritual is a term of Othering– to use the Saidian/postcolonial buzzword. Within a culture, noone believes that one is performing a ritual, whether it be shaking hands, yelling “charge!” during a baseball game, or saying mantras like “goodbye” to punctuate conversations. But it has become increasingly frequent for people in a neocolonial frenzy to find ritualistic behaviors in other cultures, and because they are rituals, are a priori “irrational” by appealing to the lazy associations. pokes fun at a village which maintains an impression in grass that has been there for centuries. They don’t know why they do it, but they just do. Maher immediately dubs it a religion. “That’s what fascinates me about religion,” he smugly states. Well played. Find an excuse to call anything you want “religious behavior,” and you’ve earned a ferry across any justifications you need to provide to show why that behavior is bad. The name of the game seems to be, “if you don’t know why you do it, it’s a ritual, and that means you’re retarded.” The other side of this coin are the Hindutva retards who try and find “meaning” for Indian rituals by appealing to pseudoscience and technobabble. You touch on a very interesting point. I think that tendency you spoke of is here too. I was on here a while back arguing that touching the feet of elders in India is isomorphic to shaking hands, bowing, hugging, or whatever. I was told, however, that touching feet is pernicious. This is ostensibly because it is viewed as “religious” behavior. That despite the fact that it is thoroughly secularized at this point– watch shows like Indian idol and you’ll see contestants doing it to the judges. And then the ad hoc explanations for this indictment followed. “Touching feet of elders can make you accept their crazy views.” So now we’re not only assuming that elders have crazy views, but also making assertions without proof. Have you conducted studies to show a causation, or even a correlation, between touching feet and accepting views? I guess when you have to indict something a priori though, standards of rigor go out the window. Label a behavior as religious– and exactly as you said– you don’t have to have rigor on your side at all. Well, Dr. Kamath does say that the ritual is *mindless*, not only implying that it’s without belief, but also that is without *any* reason — thus it is irrational. That is, it isn’t «irrational» because of being a ritual, rather it is irrational by virtue of being a *mindless* ritual. Any ritual has an inherent cost — physical energy needed to perform it, and emotional anxiety if abstained from. Rituals like shaking hands, touching elders’ feet, or saying goodbye have net social benefits, so are widespread. Cat-under-basket has no benefit atached to it (religious or otherwise), hence its better to avoid it altogether. The problem with rituals is that they keep on increasing. New rituals never eradicate old ones, and particularly severly afflicted people have Obsessive Compulsive Disorder. Such behaviour must be, as it were, nipped in the bud. Thank you for your excellent response that runs counter to the grain. Very thought provoking indeed. I intend to read Bill Maher’s stuff when I can. Of course he talks about the cat ritual in isolation. Let us just take the belief system of someone who performs the pooja as a given and not question it. The pooja involves praying to God while making an offering of food. When it so happened that a cat ate the food before the pooja could be performed someone came up the idea of involving the cat in the pooja. If in the following year a cat did not eat the food offered to God then wouldn’t you agree that there is no need to alter the procedure for the pooja. Dr. Kamath is just pointing this out with out actually questioning the pooja itself. So his rebuke makes perfect sense particularly when you view the cat ritual in isolation. Do you remember Raif Badawi? New here..How active is this community? ?